The Unbeatable Squirrel Girl #33 review: I think I'm a clone now – AiPT! Squirrel Girl, Kraven the Hunter and the rest of the gang need to work their way out of a deadly escape room. Y’all, Kraven the Hunter’s Twitter is @unshavenkraven. This is the most important news of the day. Forget politics, forget video games, THIS. 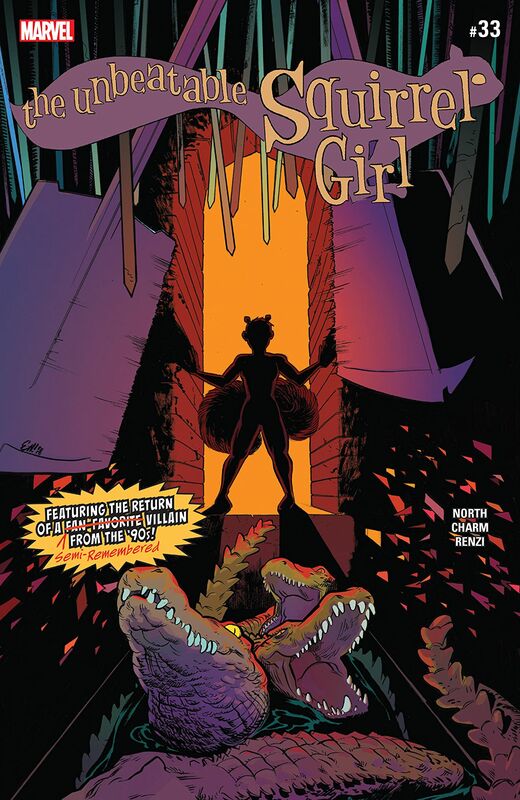 In the second issue of Derek Charm’s run as artist on The Unbeatable Squirrel Girl, the gang finds themselves Scooby-Doo’d into an actually deadly escape room run by a knock-off Mum’Ra. With the walls literally closing in, how could the team’s super powers (secret or not-so-secret) help them get out of this pickle? I think my favorite part of this issue, rather than the reveal of both Squirrel Girl and Chipmunk Hunk’s super secret powers, was that the last test in the escape room was a legit escape room puzzle. While not solvable without being in the room, it was a well done set-up by writer Ryan North, capitalizing on a fun trend in adventure gaming. Putting the ER and the silliness aside, Charm’s art has worked seamlessly with Squirrel Girl and North’s writing, bringing a completely different take than the previous artist, Erika Henderson, but not losing any of the, forgive me, charm of the characters or setting. As for North, having Kraven the Hunter join up with SG and her crew to run an escape room in an attempt to convince him that fun and togetherness could keep him from being such a super-villain all the time is a very low-key way to solve the problems caused by several super-criminals. Not sure it would work on everyone, but I’ll bet Doc Ock could rock an adventure game. Unlike other comics that have recently changed artists and broke my heart, Squirrel Girl is rocking the transition, getting the initial mini-adventure out of the way with aplomb and heading directly into the next, larger arc involving net guns and cops on skateboards. Policing in Marvel’s New York City must be rad. Kudos to the SG team for keeping things moving in the right direction. The Unbeatable Squirrel Girl is one of the most sincere and consistently funny books on the shelf today. Still no Tippy Toe? Can Charm draw squirrels yet? I bet it's hard to do.